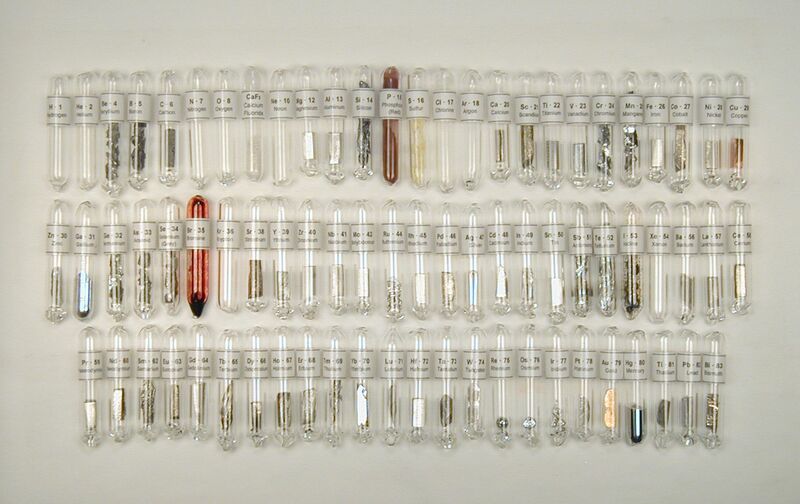 Offered here is a nearly complete set of element samples permanently sealed in glass ampoules. There are 76 different element samples in the set; this is an expanded version of our 30-piece set, 58-piece set and 68-piece set. 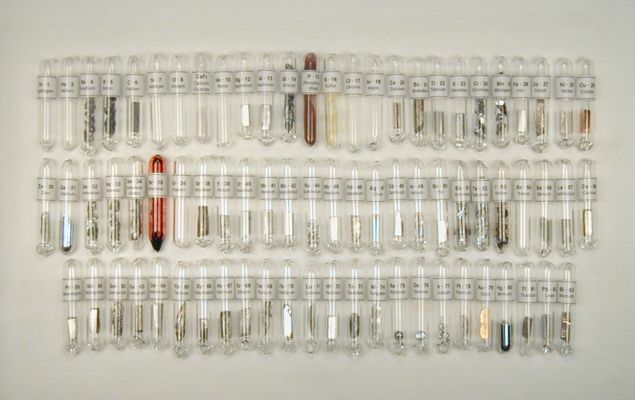 This set contains all the non-radioactive elements in the periodic tabe with the exception of the alkali metals. The ampoules are about 1 1/2 inches long (37mm) and about 1/4 inch diameter (7 mm). The elements that are included in the set are: Aluminum, Antimony, Argon, Arsenic, Barium, Beryllium, Bismuth, Boron, Bromine, Cadmium, Calcium, Carbon, Cerium, Chlorine, Chromium, Cobalt, Copper, Dysprosium, Erbium, Europium, Fluorine (as Calcium Fluoride), Gadolinium, Gallium, Germanium, Gold, Hafnium, Helium, Holmium, Hydrogen, Indium, Iodine, Iridium, Iron, Krypton, Lanthanum, Lead, Lutetium, Magnesium, Manganese, Mercury, Molybdenum, Neodymium, Neon, Nickel, Niobium, Nitrogen, Osmium, Oxygen, Palladium, Phosphorus, Platinum, Praseodymium, Rhenium, Rhodium, Ruthenium (as chips), Samarium, Scandium, Selenium, Silicon, Silver, Strontium, Sulfur, Tantalum, Tellurium, Terbium, Thallium, Thulium, Tin, Titanium, Tungsten, Vanadium, Xenon, Ytterbium, Yttrium, Zinc and Zirconium. All the metal and non-metal solid elements are sealed in Argon gas or a deep vacuum to preserve either the shine of the metal or the appearance of the element. The gases are sealed under normal atmospheric pressure. The metal samples provided within the ampoules are either square cut slabs or pieces chopped or cut from larger pieces. All the ampoules are neatly labeled with the element symbol, name and atomic number. The set will be safely packaged to prevent breakage during shipment. Questions or comments about this element set are encouraged. Made in U.S.A. Send an email to us if you have any questions. These element sets can be customized in an infinite amount of ways for you if you wish. There will probably be a price increase but we would be happy to provide a quote on a customized set. The sample selection, size, ampoule size, and labeling can be varied if desired. Send an email to us if you have any questions. Delivery time is typically 3 weeks from receipt of order.